"LaGuardia" redirects here. For the mayor for whom the airport is named, see Fiorello H. La Guardia. For other uses, see La Guardia. LaGuardia Airport (IATA: LGA, ICAO: KLGA, FAA LID: LGA) /ləˈɡwɑːrdiə/ is an international airport in the northern part of the New York City borough of Queens in the United States. It is on the waterfront of Flushing and Bowery Bays in East Elmhurst and borders the neighborhoods of Astoria and Jackson Heights. The airport is the third busiest airport serving New York City, and the twentieth busiest in the United States. LaGuardia Airport covers 680 acres (280 ha). East Elmhurst, Queens, New York City, New York, U.S. In 2016, LaGuardia Airport had a strong growth in passenger traffic; about 29.8 million passengers used the airport, a 14.2 percent increase from the previous year. LaGuardia is the busiest airport in the United States without any international services (with the exception of Montreal and Toronto in Canada). A perimeter rule prohibits nonstop flights to or from points beyond 1,500 miles (2,400 km), but exceptions to the perimeter rule are flights on Saturdays and flights to Denver. International flights without border preclearance must use the nearby JFK or Newark airports, as there is no border control facility at the airport. Glenn H. Curtiss Airport (named after aviation pioneer Glenn Hammond Curtiss), later renamed North Beach Airport, was the earlier airport at this location. 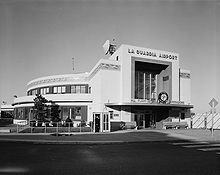 The name was changed after New York City's takeover and reconstruction to New York Municipal Airport–LaGuardia Field, and in 1953 became "LaGuardia Airport", named for Fiorello La Guardia, the mayor of New York when the airport was built. LaGuardia has been frequently criticized for some of its outdated facilities. Former Vice President Joe Biden compared LaGuardia to a "third world country" and the airport has been ranked in numerous customer surveys as the worst in the United States. Among pilots, it is referred to as "USS LaGuardia", because the runways are short and surrounded by water, thus giving the feel of landing on an aircraft carrier. On July 27, 2015, New York Governor Andrew Cuomo announced a reconstruction plan that would completely replace the existing airport. The reconstruction project broke ground in 2016 and is set to be complete by May, 2026. The LGA Airport Redevelopment Program is being constructed by Skanska–Walsh joint venture for the Terminal B Replacement Project and the Construction Manager is STV Group–Tishman Realty & Construction joint venture. The site of the airport was originally used by the Gala Amusement Park, owned by the Steinway family. It was razed and transformed in 1929 into a 105-acre (42 ha) private flying field named Glenn H. Curtiss Airport after the pioneer Long Island aviator, later called North Beach Airport. The initiative to develop the airport for commercial flights began with an outburst by New York mayor Fiorello La Guardia (in office from 1934 to 1945) upon the arrival of his TWA flight at Newark Airport – the only commercial airport serving the New York City region at the time – as his ticket said "New York". He demanded to be taken to New York, and ordered the plane to be flown to Brooklyn's Floyd Bennett Field, giving an impromptu press conference to reporters along the way. He urged New Yorkers to support a new airport within their city. American Airlines accepted La Guardia's offer to start a trial program of scheduled flights to Floyd Bennett, although the program failed after several months because Newark's airport was closer to Manhattan. La Guardia went as far as to offer police escorts to airport limousines in an attempt to get American Airlines to continue operating the trial program. During the Floyd Bennett experiment, La Guardia and American executives began an alternative plan to build a new airport in Queens, where it could take advantage of the new Queens–Midtown Tunnel to Manhattan. The existing North Beach Airport was an obvious location, but much too small for the sort of airport that was being planned. With backing and assistance from the Works Progress Administration, construction began in 1937. Building on the site required moving landfill from Rikers Island, then a garbage dump, onto a metal reinforcing framework. The framework below the airport still causes magnetic interference on the compasses of outgoing aircraft: signs on the airfield warn pilots about the problem. Because of American's pivotal role in the development of the airport, LaGuardia gave the airline extra real estate during the airport's first year of operation, including four hangars, which was an unprecedented amount of space at the time. American opened its first Admirals Club (and the first private airline club in the world) at the airport in 1939. The club took over a large office space that had previously been reserved for the mayor, but he offered it for lease following criticism from the press, and American vice president Red Mosier immediately accepted the offer. The airport was dedicated on October 15, 1939, as the New York Municipal Airport, and opened for business on December 2 of that year. It cost New York City $23 million to turn the tiny North Beach Airport into a 550-acre (220 ha) modern facility. Not everyone was as enthusiastic as La Guardia about the project; some[who?] regarded it as a $40 million boondoggle. But the public was fascinated by the very idea of air travel, and thousands traveled to the airport, paid the dime fee, and watched the airliners take off and land. Two years later these fees and their associated parking had already provided $285,000, and other non-travel related incomes (food, etc.) were another $650,000 a year. The airport was soon a financial success. A smaller airport in nearby Jackson Heights, Holmes Airport, was unable to prevent the expansion of the larger airport and closed in 1940. Newark Airport began renovations, but could not keep up with the new Queens airport, which TIME called "the most pretentious land and seaplane base in the world". Even before the project was completed LaGuardia had won commitments from the five largest airlines (Pan American Airways, American, United, Eastern Air Lines and Transcontinental & Western Air) to begin using the new field as soon as it opened. Pan Am's transatlantic Boeing 314 flying boats moved to La Guardia from Port Washington in 1940. 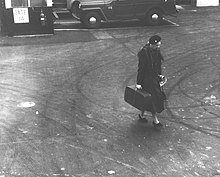 During World War II the airport was used to train aviation technicians and as a logistics field. 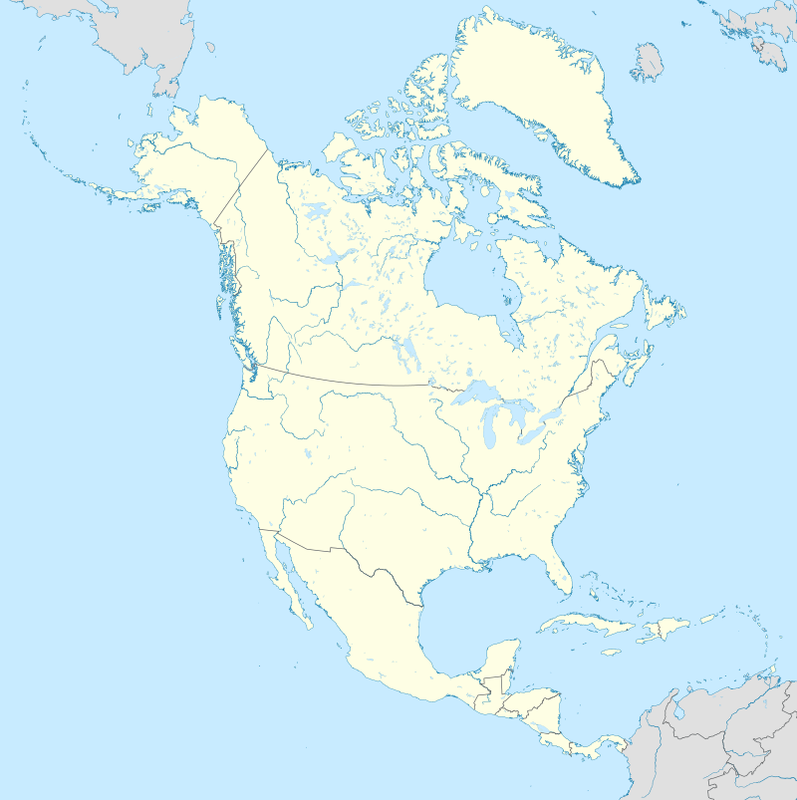 Transatlantic landplane airline flights started in late 1945; some continued after Idlewild (now John F. Kennedy International) opened in July 1948, but the last ones shifted to Idlewild in April 1951. Newspaper accounts alternately referred to the airfield as New York Municipal Airport and LaGuardia Field until the modern name was officially applied when the airport moved to Port of New York Authority control under a lease with New York City on June 1, 1947. LaGuardia opened with four runways at 45-degree angles to each other, the longest (13/31) being 6,000 ft (1,800 m). Runway 18/36 was closed soon after a United DC-4 ran off the south end in 1947; runway 9/27 (4,500 ft) was closed around 1958, allowing LaGuardia's terminal to expand northward after 1960. Circa 1961 runway 13/31 was shifted northeastward to allow construction of a parallel taxiway (such amenities being unknown when LGA was built) and in 1965–66 both remaining runways were extended to their present 7,000 ft (2,100 m). The April 1957 Official Airline Guide shows 283 weekday fixed-wing departures from LaGuardia: 126 American, 49 Eastern, 33 Northeast, 31 TWA, 29 Capital and 15 United. American's flights included 26 nonstops to Boston and 27 to Washington National (mostly Convair 240s). Jet flights (United 727s to Cleveland and Chicago) started on June 1, 1964. Although LaGuardia was a large airport for the era in which it was built, it soon became too small. Starting in 1968 general aviation aircraft were charged heavy fees to operate from LaGuardia during peak hours, driving many GA operators to airports such as Teterboro Airport in Teterboro, New Jersey. The increase in traffic at LaGuardia and safety concerns prompted the closure of nearby Flushing Airport in 1984. Also in 1984, to further combat overcrowding at LGA, the Port Authority instituted a Sunday-thru-Friday "perimeter rule" banning nonstop flights from LaGuardia to cities more than 1,500 miles (2,400 km) away; at the time, Denver was the only such city with nonstop flights, and it became the only exception to the rule. (In 1986 Western Airlines hoped to fly 737-300s nonstop to Salt Lake City and unsuccessfully challenged the rule in federal court). Later, the Port Authority also moved to connect JFK and Newark Airport to regional rail networks with the AirTrain Newark and AirTrain JFK, in an attempt to make these more distant airports competitive with LaGuardia. In addition to these local regulations, the FAA also limited the number of flights and types of aircraft that could operate at LaGuardia. LaGuardia's traffic continued to grow. By 2000, the airport routinely experienced overcrowding delays, many more than an hour long. That year, Congress passed legislation to revoke the federal traffic limits on LaGuardia by 2007. The reduced demand for air travel following the September 11, 2001, terrorist attacks on New York City quickly slowed LaGuardia's traffic growth, helping to mitigate the airport's delays. Ongoing Port Authority investments to renovate the Central Terminal Building and improve the airfield layout have also made the airport's operations more efficient in recent years. In late 2006, construction began to replace the Wallace Harrison designed air traffic control tower built in 1962 with a more modern one. The tower began operations on October 9, 2010. On August 12, 2009, Delta Air Lines and US Airways announced a landing slot and terminal swap in separate press releases. Under the swap plan, US Airways would have given Delta 125 operating slot pairs at LaGuardia. US Airways, in return, would have received 42 operating slot pairs at Ronald Reagan National Airport in Washington, D.C., and be granted the authority to begin service from the US to São Paulo, Brazil and Tokyo, Japan. When the swap plan was complete, Delta Shuttle operations would have moved from the Marine Air Terminal to Terminal C (the present US Airways terminal), and Terminals C and D would have been connected together. US Airways Shuttle flights would have moved to the Marine Air Terminal, and mainline US Airways flights would have moved to Terminal D (the present Delta terminal). The United States Department of Transportation announced that they would approve the Delta/US Airways transaction under the condition that they sell slots to other airlines. Delta and US Airways dropped the slot swap deal in early July 2010 and both airlines filed a court appeal. In May 2011, both airlines announced that they would resubmit their proposal of the slot swap to the US DOT. It was tentatively approved by the US DOT on July 21, 2011. The slot swap received final approval from the US DOT on October 10, 2011. On December 16, 2011, Delta Air Lines announced plans to open a new domestic hub at LaGuardia Airport. The investment was the largest single expansion by any carrier at LaGuardia in decades, with flights increasing by more than 60 percent, and destinations by more than 75 percent. By summer 2013, Delta increased operations to 264 daily flights between LaGuardia and more than 60 cities, more than any other airline at LaGuardia. Delta invested $100 million to renovate terminals C and D in LaGuardia, where it now operates 32 gates. A 600-foot connector bridge has been built, linking the two terminals. Delta also converted the then US Airways lounge in Terminal C to a Delta Sky Club, while continuing to operate its current Sky Club in Terminal D. US Airways built a new club, placed next door to their old lounge, which has since become an American Airlines Admirals Club. 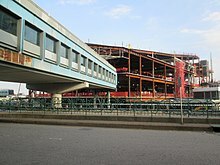 In April 2010, Port Authority director Christopher Ward announced that the agency had hired consultants to explore a full demolition and rebuilding of LaGuardia's Central Terminal. The project would create a unified, modern, and efficient plan for the airport, currently an amalgam of decades of additions and modifications. The project, expected to cost $2.4 billion, will include the demolition of the existing central terminal building and its four concourses, garage, Hangar 1, and frontage roads; building temporary facilities; and designing and building a new central terminal building. The rebuilding would be staged in phases in order to maintain operations throughout the project. Proposals were due on January 31, 2012. Patrick Foye, executive director of the Port Authority, said, "It's got a quaint, nostalgic but unacceptable kind of 1940s, 1950s feel that's just not acceptable." The Port Authority was seeking a private company to develop and operate the replacement terminal with private funds, similar to how Delta operates the other terminals at the airport. However, in January 2014, Governor Andrew Cuomo announced a plan for the state to oversee construction of the long-stalled new terminal project instead of the proposed public-private partnership. On July 27, 2015, Governor Andrew Cuomo, joined by then-Vice President Joe Biden, announced a $4 billion plan to rebuild the terminals as one contiguous building with terminal bridges connecting buildings. Airport officials and planners had concluded that the airport essentially had to be torn down and rebuilt. Under the airport reconstruction plan disclosed in 2015, a single terminal building is to be constructed in stages, with a people mover, retail space and a new hotel. Some 2 miles (3.2 km) of additional taxiways are to be built. A people mover is to connect the new terminal sections, the Grand Central Parkway is to be reconfigured, and AirTrain LaGuardia, previously announced, will connect the airport to the Mets–Willets Point subway station and the Mets–Willets Point LIRR station. A proposed high-speed ferry, if introduced, will service the Marine Air Terminal, a national historic landmark, which will remain intact. An onsite tram has also been proposed to move passengers more quickly within the central terminal. The new airport is to be eco-friendly and contain accommodations such as a hotel of approximately 200 rooms and a business/conference center. The entire airport will move 600 feet (180 m) closer to the Grand Central Parkway. New parking garages replaced parking facilities between the existing terminals and Grand Central Parkway, creating space for the new facilities. By locating the terminals closer to the Grand Central Parkway, additional space for aircraft taxiways and hold areas will be created, reducing ground delays. The runways themselves will not be reconfigured. Construction of the project's first phase started in spring of 2016, once final plans were approved by the Port Authority board, with the entire redevelopment scheduled to be completed by 2021. Terminal B will be demolished, and Delta will rebuild its terminals C and D in coordination with the plan. This is as both the airline and Port Authority have agreed to work together in building the single terminal. The new airport will feature an island gate system, with passengers connecting between the terminal building and the gates via bridges that will be high enough for aircraft to taxi under. In late March 2016, the comprehensive plans for the redevelopment were approved unanimously. Construction costs were estimated to range from $4 billion to $5.3 billion. In August 2017, Magic Johnson Enterprises and Loop Capital created a joint venture named JLC Capital to invest in Phase 2 of LaGuardia Airport's reconstruction. The same month, Delta broke ground on the last phase of the airport's reconstruction. On December 9, 2017, six airlines moved at LGA. Alaska Airlines and JetBlue moved to the Marine Air Terminal. American consolidated in Terminal B. Delta Shuttle operates from Terminal C. Frontier and Spirit depart from Terminal C and arrive at Terminal D. The first half of the seven-level West Parking Garage opened in February 2018, with 1,600 of 3,100 parking spaces being made available, and the rest of the garage was opened later that year. Eleven new gates at Terminal B opened on December 1, 2018, and were used by Air Canada, American Airlines, and Southwest Airlines. The other seven gates are scheduled to open in 2020. The new space included a concourse with a 55-foot-tall (17 m) ceiling, food concessions, an FAO Schwarz toy store, and an indoor play area. LaGuardia has four terminals (A, B, C and D) connected by buses and walkways. Signage throughout the terminals was designed by Paul Mijksenaar. As with the other Port Authority airports, some terminals at LaGuardia are managed and maintained by airlines themselves. Terminal B was under direct Port Authority operation, but as of 2016, operation of Terminal B has been transferred to private company, LaGuardia Gateway Partners. The Marine Air Terminal (MAT) was the airport's original terminal for overseas flights. The waterside terminal was designed to serve the fleet of flying boats, or Clippers, of Pan American Airways, America's main international airline throughout the 1930s and 1940s. When a Clipper landed in Long Island Sound, it taxied to a dock where passengers could disembark into the terminal. During World War II new four-engine land planes were developed, and flying boats stopped carrying scheduled passengers out of New York after 1947. The last Pan American flight left the terminal in February 1952, bound for Bermuda. The terminal is home of the largest mural created during the Roosevelt-era Works Progress Administration Federal Art Project. Created by New York artist James Brooks, the mural, Flight, encircles the upper rotunda walls, telling the story of man's conquest of the heavens up through 1942 when the work was completed. During the 1950s, many WPA artists were thought to be in collusion with Communists. Several works of art that had been created for post offices and other public facilities were therefore destroyed. Likewise, Flight was completely painted over with wall paint by the Port Authority of New York & New Jersey. In the late 1970s, Geoffrey Arend, an aviation historian and author of Great Airports: LaGuardia, mounted a campaign to restore the mural to its original splendor. With the help of Brooks, LaGuardia Airport manager Tim Peirce, and donations from Reader's Digest founders DeWitt Wallace and Laurance Rockefeller, Flight was rededicated in 1980. In 1986, Pan Am restarted flights at the MAT with the purchase of New York Air's shuttle service between Boston, New York City, and Washington, D.C. In 1991, Delta Air Lines bought the Pan Am Shuttle and subsequently started service from the MAT on September 1. In 1995, the MAT was designated as a historic landmark. A $7 million restoration was completed in time for the airport's 65th anniversary of commercial flights on December 2, 2004. On December 9, 2017, JetBlue and Alaska Airlines relocated to the MAT while Delta consolidated all Delta Shuttle flights to Terminal C. On October 27, 2018, Alaska Airlines ended all service from LaGuardia Airport, leaving JetBlue as the terminal's only tenant. The Central Terminal Building (CTB) serves most of LaGuardia's airlines. It is six blocks long, consisting of a four-story central section, two three-story wings and four concourses (A, B, C, and D) with 40 aircraft gates. The $36 million facility designed by Harrison & Abramovitz was dedicated on April 17, 1964. Delta and US Airways left the CTB in 1983 and 1992 respectively for their own dedicated terminals on the east side of the airport. The Port Authority and various airlines carried out a $340 million improvement project in the 1990s to expand and renovate the existing space. Eleven new gates at Terminal B opened on December 1, 2018. An additional seven gates are scheduled to open in 2020. As of December 9, 2017, Air Canada, American, Southwest and United operate out of Terminal B.
Terminal C, the 300,000-square-foot (28,000 m2), designed by William Nicholas Bodouva + Associates Architects and Planners, was opened September 12, 1992, at a cost of $250 million. The original tenant was intended to be Eastern Air Lines, but when Eastern was forcibly bankrupt in an effort by parent Texas Air Corporation to merge its assets with that of sister airline Continental, Continental assumed the leases. Continental never moved in, as it sold its leases and most of its LaGuardia slots to US Airways as part of Continental's bankruptcy restructuring. Trump Shuttle, successor to the Eastern Shuttle, also occupied the terminal before becoming part of US Airways. The Port Authority of New York and New Jersey says that the terminal handles approximately 50% of regional airliner traffic at LaGuardia. As a result of a slot-swap deal between Delta and US Airways, as of July 2012, Delta occupies the majority of the terminal (gates C15–C44). American (the former US Airways flights) operated some flights from gates C35–C44 until December 9, 2017. Gates on the east side of the lower level do not have jet bridges and are used to transport passengers via buses to and from Delta Connection flights parked at remote stands on the east side of the airport. Passengers must use air stairs to board/deplane these flights. As of December 9, 2017, Delta and Delta Connection operate out of Terminal C. Frontier and Spirit also use Terminal C for their departures, however, their arriving flights use Terminal D.
Terminal D, opened on June 19, 1983, at a cost of approximately $90 million, was designed by William Nicholas Bodouva + Associates Architects to accommodate Delta's new Boeing 757 and Boeing 767 aircraft. Delta had virtually exclusive use of this terminal, however, today some gates are now used by Canadian low-cost carrier WestJet as well as Spirit and Frontier. As of December 9, 2017, Delta, Delta Connection, and WestJet operate out of Terminal D. Terminal D also houses the arriving flights for Frontier and Spirit. Terminal D is connected to Terminal C by a 600-foot walkway, which opened in early 2013 as part of Delta's effort to build a hub at LaGuardia. Although there is no separate terminal building for general aviation aircraft a pseudo-terminal is operated within the Marine Air Terminal (Terminal A), which is currently run by Sheltair Aviation providing full FBO services to private and charter aircraft owners-pilots including 100LL and Jet A fueling, computerized weather and flight planning as well as pilot and passenger lounges. To access the General Aviation terminal an on-airport tenant must possess a SIDA (Security Identification Display Area) badge for unescorted access, transient aircraft owners-pilots and passengers must be escorted at all times into and out of the GA Terminal and to the ramp and hangar areas by the FBO staff. Following the events of the terrorist attacks on September 11, 2001 the Federal Aviation Administration changed the rules for the landing and departure of general aviation aircraft at LaGuardia. Pilots operating a non-scheduled IFR flight are now required to make a reservation via the FAA's e-CVRS system no more than 72 hours prior to the flight's arrival or departure while public charter flights may make a reservation up to six months prior. Unscheduled IFR flights may only operate at LaGuardia with a reservation from the hours of 6:00am to 9:59pm local time Monday thru Friday and 12:00pm to 9:59pm local time on Sundays. Reservations for unscheduled IFR flights are not required all day on Saturdays. Aircraft without a reservation will be redirected to either Teterboro Airport or Linden Airport. When New York Air was in operation, its headquarters were in Hangar 5 at LaGuardia. The Port Authority of New York and New Jersey Police Department (PAPD) provides law enforcement and fire-rescue services to the airport. Its LaGuardia Airport Command is located in Building 137. Emergency medical services are provided by North Shore University Hospital under contract to the Port Authority. All domestic destinations from LaGuardia Airport (LGA). • Blue represents destinations to which service is being terminated. All international destinations from LaGuardia Airport (LGA). There are also many private bus lines operating express buses to Manhattan, the Hudson Valley, and Long Island. The Port Authority runs two free shuttle bus routes, which operate at all times except overnight hours, within the airport connecting all terminals and parking lots. Taxicabs serving the airport are licensed by New York City Taxi & Limousine Commission. The fares within New York City are metered. Uniformed taxi dispatchers are available to assist passengers before they start the rides. The airport is accessible directly from Grand Central Parkway. New York City's limousine services, which are also licensed by the Taxi & Limousine Commission, offer various rates ranging from $40 to $150 from LGA to Manhattan (excluding tips and tolls) in a sedan or limousine. No New York City Subway routes serve the airport directly, but provisions for a transit connection were made in a 2014 long-range rebuilding plan by the subway's operator, the MTA. A similar plan to bring BMT Astoria Line service (N and ​W trains) to the airport was defeated in 2003. On January 20, 2015, New York Governor Andrew Cuomo announced AirTrain LGA, a plan to build a people mover, similar to AirTrain JFK, running along the Grand Central Parkway. This people mover would connect the airport to Willets Point, and would connect there with the New York City Subway's 7 and <7>​ trains at the Mets – Willets Point station and with the Long Island Rail Road at a separate Mets – Willets Point station. As of June 2018[update], the AirTrain would start construction in 2020 and be completed by 2022. ^ ":: American Airlines Newsroom". ^ a b "2010 North American final rankings". Archived from the original on February 8, 2008. ^ "The Port Authority of NY & NJ". www.panynj.gov. ^ "Port Authority Airports set new Record with more than 129 Million Passengers Traveling in 2016" (Press release). The Port Authority of New York & New Jersey. January 28, 2015. Retrieved August 27, 2015. ^ "2000 Passenger Statistics: North America's Busiest Airports" (PDF). Archived from the original (PDF) on December 1, 2007. Retrieved July 7, 2012. ^ "Long Distance at La Guardia". The New York Sun. August 4, 2005. Retrieved March 4, 2010. ^ Jackson, Kenneth T., ed. (1995). The Encyclopedia of New York City. The New-York Historical Society; Yale University Press. p. 470. ^ a b c d Amon, Rhoda (May 13, 1998). "Major Airports Take Off / Mayor LaGuardia's complaint leads to an airport; but soon, another is needed". Newsday. Long Island, New York. p. A17. Retrieved July 7, 2012. ^ Krumboltz, Mike (February 6, 2014). "Biden compares New York's LaGuardia airport to 'third world country'". Yahoo News. Retrieved February 6, 2014. ^ Wien, Kent (December 25, 2012). "Cockpit Chronicles: A Landing Fit For A King". Gadling.com. Retrieved April 4, 2014. ^ "12 WPA Projects that Still Exist". How Stuff Works. Publications International, Ltd. Retrieved March 11, 2009. ^ Steinke, Sebastian (August 2005). "La Guardia: New York City's Airport". Flug Review. Archived from the original on May 18, 2009. Retrieved July 7, 2012. ^ "American Airlines Group, Inc. Reshuffles Flights at LaGuardia Airport – American Airlines is dropping flights in some markets with overcapacity to make room for seven new destinations". fool.com. Retrieved September 2, 2010. ^ "Admirals Club History". American Airlines. Archived from the original on July 18, 2012. Retrieved September 2, 2010. ^ "150,000 TO SEE NORTH BEACH OPENING FETE: Dedication Of Airport Tomorrow Is Hailed As Boon To Queens". Long Island Star-Journal. Fultonhistory.com. October 14, 1939. p. 1. Retrieved March 26, 2016. ^ "150,000 TO SEE NORHT BEACH OPENING FETE: Dedication Of Airport Tomorrow Is Hailed As Boon To Queens". Long Island Star-Journal. Fultonhistory.com. October 14, 1939. p. 2. Retrieved March 26, 2016. ^ "La Guardia's Coup". Time. September 12, 1938. Retrieved July 7, 2012. ^ "La Guardia Airport, N.Y." New York State Archives. September 26, 1947. Retrieved July 7, 2012. ^ DeCota, William R. (June 16, 2001). "Air Traffic Congestion in the New York–New Jersey Metropolitan Region". United States House of Representatives. Archived from the original on March 26, 2003. Retrieved July 7, 2012. ^ Altherr, Stacey (October 10, 2010). "New Control Tower Up and Running at LaGuardia". Newsday. Retrieved April 6, 2011. (Subscription required (help)). ^ "Delta Reinforces New York Commitment with Plan for Domestic Hub at LaGuardia Airport" (Press release). Delta Air Lines. August 12, 2009. Retrieved August 12, 2009. ^ "US Airways Announces Slot Transaction With Delta Air Lines" (Press release). US Airways. August 12, 2009. Retrieved August 12, 2009. ^ "Delta and US Airways Drop Slot Swap". ABC News. Associated Press. July 2, 2010. Retrieved August 5, 2010. ^ "DOT Proposes to Grant Delta/US Airways Slot Waiver with Conditions" (Press release). U.S. Department of Transportation. July 21, 2011. Retrieved August 28, 2015. ^ "Delta and US Airways Welcome DOT Approval of Slot Transaction" (Press release). PR Newswire. October 13, 2011. Retrieved June 15, 2012. ^ "Delta Unveils Schedule for New Domestic Hub at New York's LaGuardia Airport" (Press release). Delta Air Lines. December 16, 2011. Retrieved July 7, 2012. ^ Worrell, Carolina (August 2, 2013). "4 Teams Shortlisted for $2.4B LaGuardia Terminal Building Replacement". ENR New York. Dodge Data & Analytics. Retrieved August 27, 2015. ^ Feiden, Doug (April 28, 2010). "Port Authority chief: Tear down Queens' La Guardia Airport". New York Daily News. Retrieved April 28, 2010. ^ Hawley, Chris (February 1, 2012). "World Trade Center Design Flaw Could Cost Millions". News & Record. Associated Press. Archived from the original on September 3, 2012. Retrieved February 1, 2012. ^ "Gov. Cuomo: NY to do JFK, LaGuardia construction". Businessweek. January 8, 2014. Retrieved April 4, 2014. ^ McGeehan, Patrick (July 27, 2015). "La Guardia Airport to Be Overhauled by 2021, Cuomo and Biden Say". The New York Times. Retrieved July 28, 2015. ^ a b c Tishman, Dan; et al. (July 27, 2015). A 21st Century Airport for the State of New York: The New LaGuardia (PDF Governor's Office) (Report). Airport Advisory Panel, The State of New York. Retrieved August 27, 2015. ^ "NY Gov Cuomo details $4B overhaul for LaGuardia Airport". CNBC. July 27, 2015. Retrieved July 27, 2015. ^ a b Barone, Vincent (December 3, 2018). "A breakdown of the LaGuardia Airport renovation". am New York. Retrieved December 13, 2018. ^ McGeehan, Patrick (July 27, 2015). "La Guardia Airport to Be Overhauled by 2021, Cuomo and Biden Say". The New York Times. Retrieved August 27, 2015. ^ Plitt, Amy (June 14, 2016). "New looks at LaGuardia Airport's $4B, '21st-century' revamp". Curbed NY. Retrieved October 5, 2016. ^ Governor's Press Office (July 27, 2015). "Governor Cuomo Unveils Vision For Transformative Redesign of LaGuardia Airport" (Press release). Albany, New York: New York State. Retrieved August 27, 2015. ^ "$4 billion redevelopment of aging LaGuardia Airport approved". US News & World Report. ^ "The Multi-Billion Dollar LaGuardia Redevelopment Has Been Approved". Condé Nast Traveler. ^ "LaGuardia Renovation - Port Authority New York New Jersey". The Real Deal New York. March 24, 2016. ^ Parry, Bill (August 11, 2017). "Magic Johnson's firm invests in LaGuardia Airport reconstruction". TimesLedger. Retrieved September 1, 2017. ^ Warerkar, Tanay (August 8, 2017). "LaGuardia Airport's new Delta terminals get renderings". Curbed NY. Retrieved April 5, 2018. ^ "$4 billion construction on LaGuardia's new Delta terminal takes flight". Metro US. August 8, 2017. Retrieved April 5, 2018. ^ "6 airlines at LaGuardia Airport changing terminals this weekend". Retrieved February 10, 2018. ^ "New Parking Garage To Open In Part At LaGuardia Saturday". CBS New York. February 9, 2018. Retrieved December 13, 2018. ^ "LGA's First New Concourse Set to Open This Weekend". NBC New York. November 29, 2018. Retrieved November 30, 2018. ^ "LaGuardia opening 11 new Terminal B gates". am New York. November 29, 2018. Retrieved November 30, 2018. ^ a b c Rivoli, Dan (November 29, 2018). "NYC's LaGuardia Airport's new concourse to open for fliers Saturday". New York Daily News. Retrieved November 30, 2018. 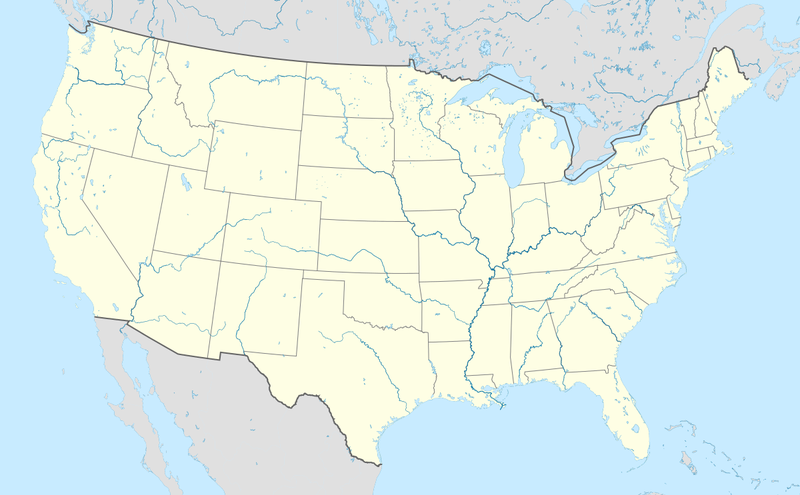 ^ "New York and New Jersey Airports". Mijksenaar BV. Retrieved May 18, 2009. ^ a b "LaGuardia Airport is about to make weekend travel so much worse". New York Post. December 6, 2017. Retrieved December 7, 2017. ^ White, Norval; Willensky, Elliot; Leadon, Fran (2010) . "Queens West". AIA Guide to New York City (5th ed.). New York City: Oxford University Press. p. 767. ISBN 978-0-19-538385-0. Retrieved February 7, 2013. ^ "LaGuardia Airport Central Terminal Building Replacement Project Briefing Book" (PDF). Port Authority of New York and New Jersey. 2012-10-26. p. 6. Retrieved 2018-04-12. ^ McDowell, Edwin (November 16, 1991). "Continental to Sell 108 Slots at La Guardia for $61 Million". The New York Times. Retrieved September 15, 2009. ^ Salpukas, Agis (June 18, 1983). "Delta Spreads Out at La Guardia". The New York Times. p. 29. Retrieved September 15, 2009. ^ "Sheltair Aviation Services - FBO at LaGuardia Airport (KLGA)". Sheltairaviation.com. Retrieved July 27, 2017. ^ "American Airlines Expands 2019 Flight Schedule Internationally And Domestically". news.get.com. Retrieved 5 October 2018. ^ a b c d e "Summertime, and the Travel Is Easy: American Airlines Introduces 18 New Routes and Adds Seats to Paris And Madrid". news.aa.com. ^ a b "FLIGHT SCHEDULES" (PDF). Retrieved December 25, 2017. ^ "Fly Delta to Hilton Head Island, S.C., from Atlanta and New York beginning in May". Delta News Hub. ^ "Start Planning for Summer Now with More JetBlue Service to Nantucket Next Year". Retrieved 2018-11-14. ^ "Commuter Flight - Rectrix". Retrieved May 21, 2018. ^ "Flight schedules". Retrieved February 26, 2017. ^ "New York, NY: LaGuardia (LGA)". Bureau of Transportation Statistics. January 2017. Retrieved May 2, 2017. ^ "Port Authority of New York and New Jersey - JANUARY 2019 TRAFFIC REPORT" (PDF). Retrieved April 6, 2019. ^ December 2014 Traffic Report (PDF) (Report). The Port Authority of New York & New Jersey. Retrieved March 29, 2015. ^ 1997 Airport Traffic Report (PDF) (Report). The Port Authority of New York & New Jersey. Retrieved March 29, 2015. ^ 2002 Airport Traffic Report (PDF) (Report). The Port Authority of New York & New Jersey. Retrieved March 29, 2015. ^ "Taxi, Car and Van Service – Ground Transportation". Port Authority of New York and New Jersey. Retrieved March 5, 2010. ^ Hanseder, Tony. "LaGuardia LGA Airport Overview". ifly.com. Retrieved May 2, 2012. ^ Hana R. Alberts (March 19, 2014). "A Revamped La Guardia Airport Could Look Like This in 2021 – Extreme Makeovers – Curbed NY". Ny.curbed.com. Retrieved April 4, 2014. ^ "Flashback To 1999 | qgazette.com | Queens Gazette". www.qgazette.com. June 27, 2007. Retrieved March 25, 2014. ^ Honan, Katie. "Cuomo Announces AirTrain to LaGuardia Airport from Subway, LIRR". DNAinfo. Archived from the original on January 20, 2015. Retrieved January 20, 2015. ^ "Plans for AirTrain to La Guardia Airport Move Ahead Amid Criticism". The New York Times. 2018-06-25. Retrieved 2018-06-26. "New York State DOT Airport Diagram" (PDF). Archived from the original (PDF) on October 4, 2012.